You can choose your start screen to get working right away. 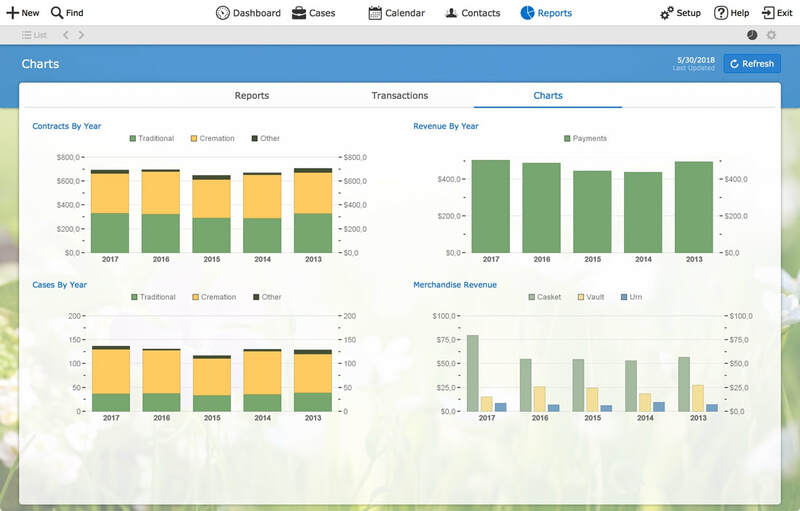 View your cases for the past 60 days, whether at-need or pre-need, plus a snapshot of case information, tasks and events. 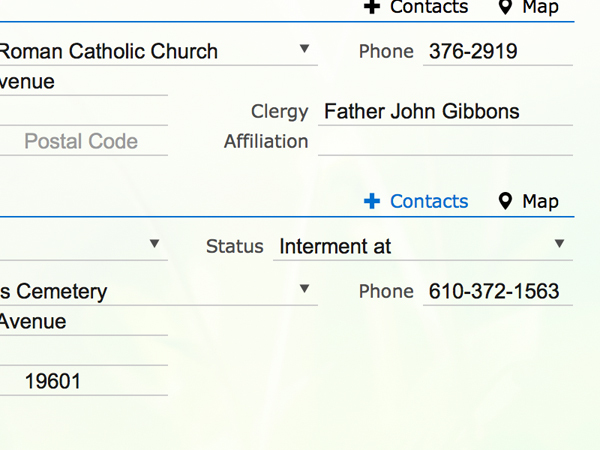 Click on a case to go to Data Entry and other sections. 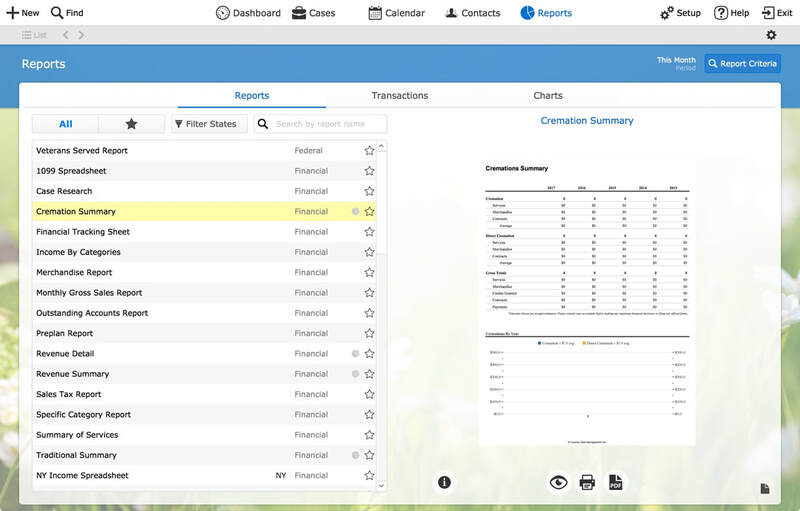 You can switch between a simplified or detailed case view. From first call to final payment. 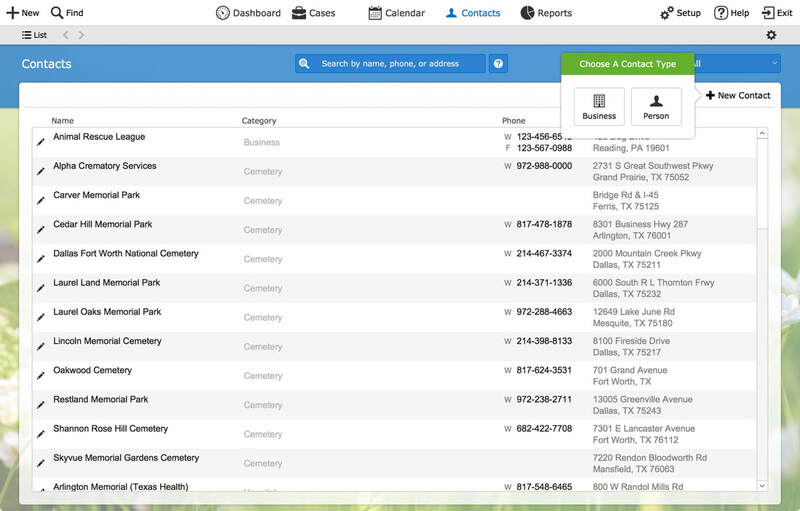 Funeral Data Manager provides a complete solution for managing your funeral home. Scan and save anything that's important to your case record to create a permanent archive. No need to interrupt your workflow. Jot down a reminder wherever you are with the Tasks panel. Various details that are relevant to a case can be easily captured in the Notes panel. 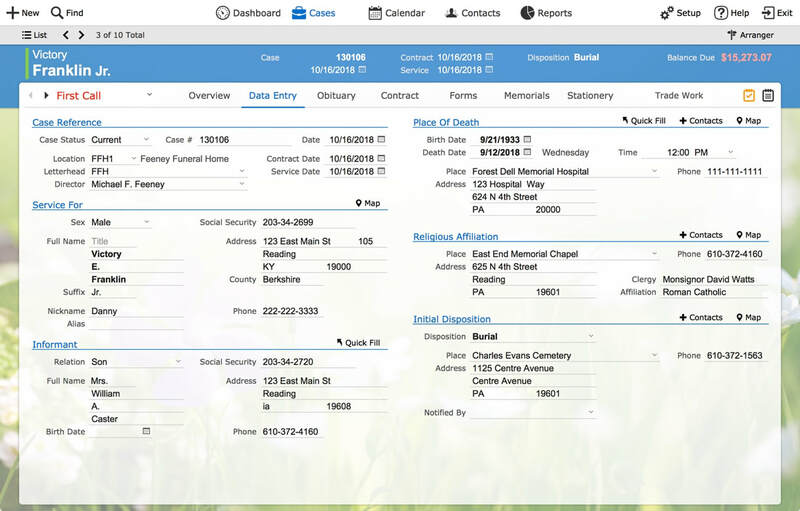 Data is essential to your funeral home, so we make sure to get it right. We know the difference between useless information and crucial details. Some information the family will have on-hand, while other information will require a phone call. 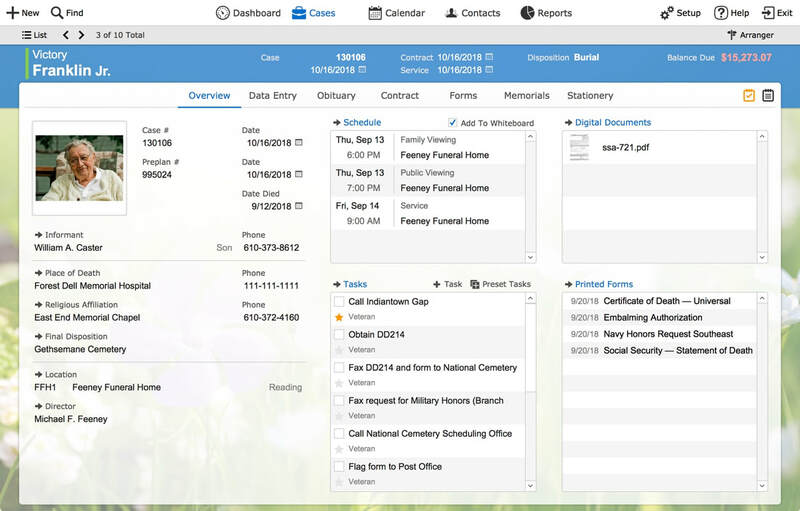 The natural flow of our data entry is a key reason many funeral homes switch to Funeral Data Manager. Never type the same information twice. Helpful shortcuts enable you to fill in repetitive data. View any place listed and get driving directions with the integrated map. Speed up data entry by saving commonly used people and places to your Contacts book. Sometimes the only thing more challenging than serving the family is getting paid. 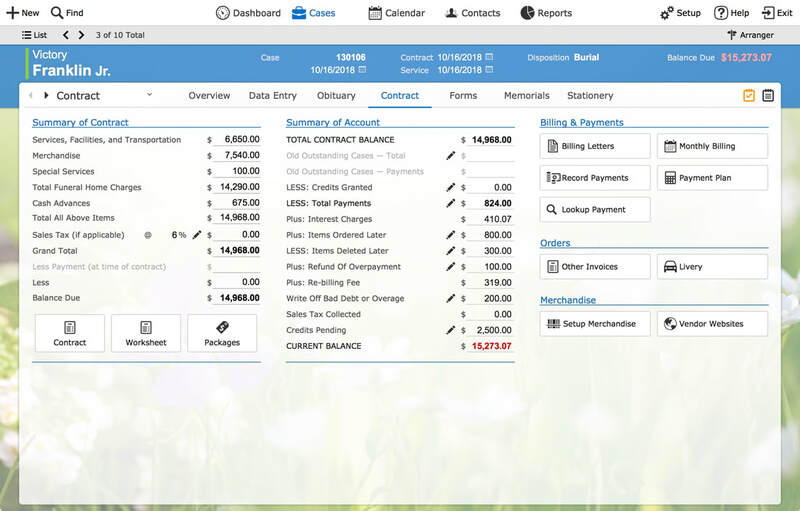 The contracts and accounts section lets you send billing notices, record payments, track pending credits, and even establish payment plans for slow paying accounts. All federal and states forms are provided and continually updated. 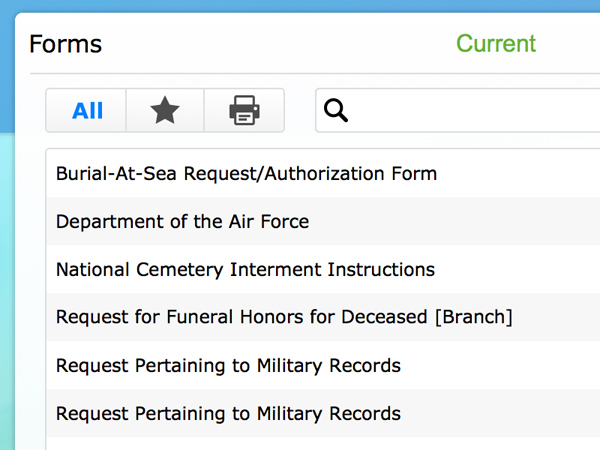 Also included are a growing collection of forms for every funeral home need, such as cemetery, cremation, preplan, general purpose, and image forms. If you have a need that isn't met by any of the included forms, we can build a custom form to your specifications at our hourly rate. 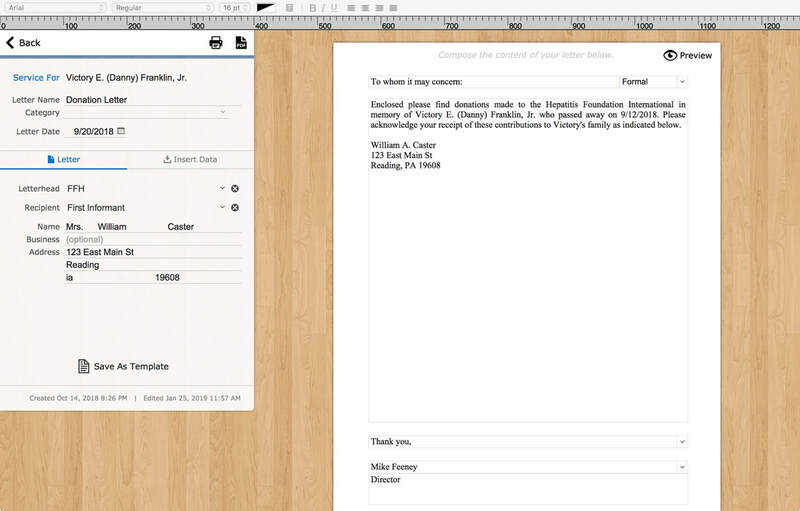 Browse form categories, search by keyword, preview, and then print or email any form. 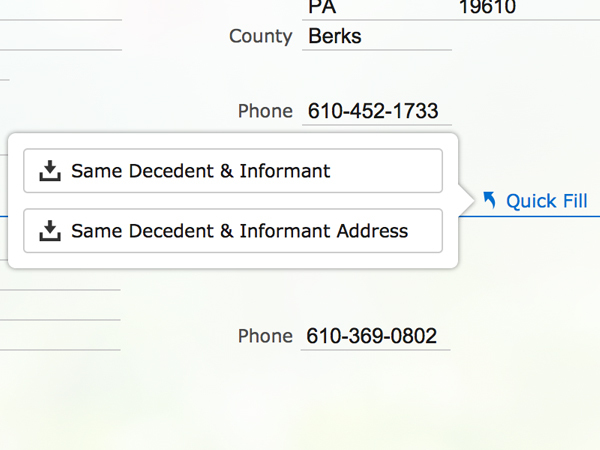 When you find a form you want to use, starring the form will keep it handy for all future cases. See a history log of every form printed for the current case. 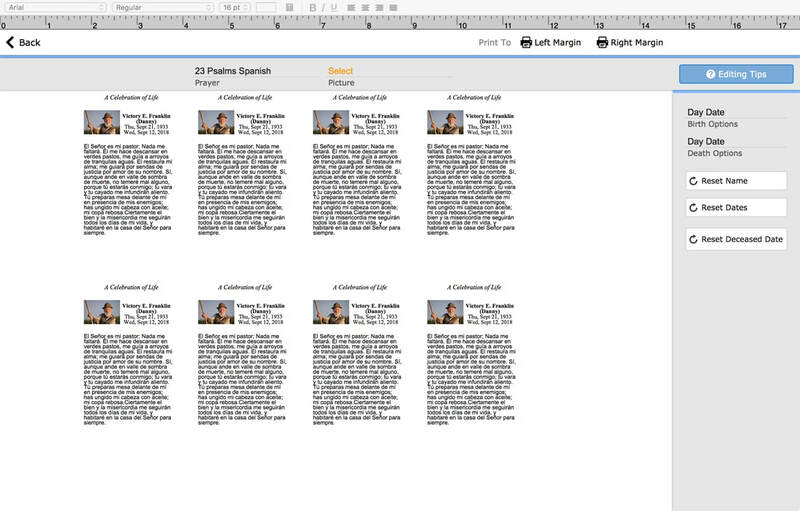 A variety of prayer card, memorial folder layouts, and register books styles are included with one-click insertion of images and prayers. We can also create any custom layout to suit your needs. 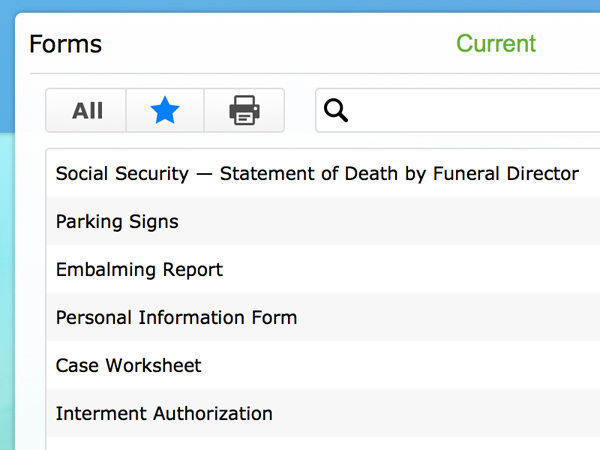 No need fiddle with a word processing program, because letters can be composed right within Funeral Data Manager. Choose from a variety of special purpose labels and envelopes as well. Your day in plain view. See your events and appointments by Day, Week, Month, or even by Resource such as staff or room. Never forget a name or place. 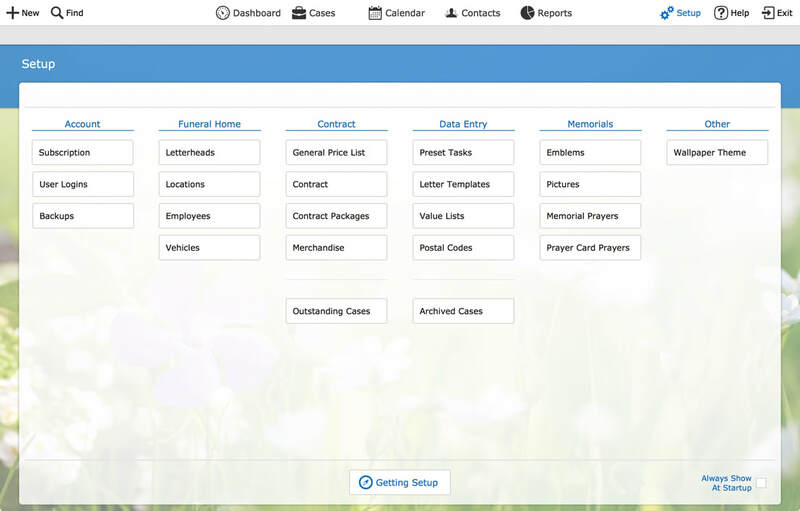 Your Contacts book is built from all the people and places you save during data entry or add to the list yourself. Pop-up list categories enable you to quickly complete data entry sections without retyping. 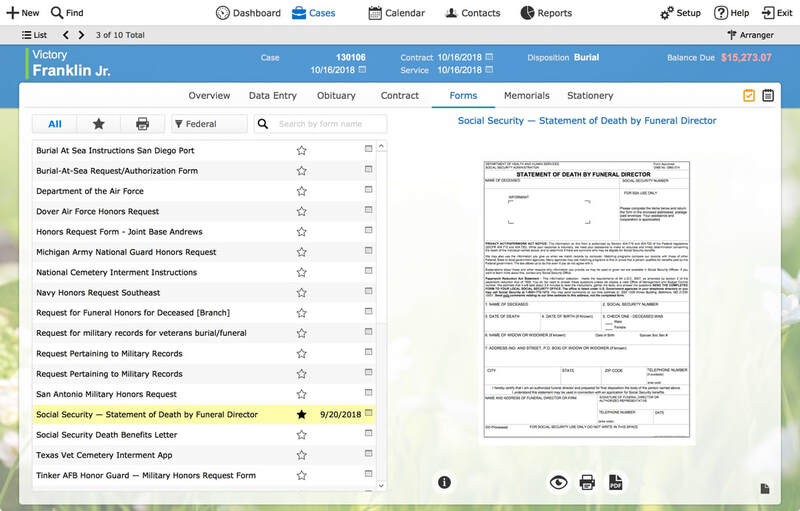 The Setup menu give you quick access to settings for your funeral home, employees, and letterhead, ​select your contract and package prices, create defaults tasks, access reports and much more. 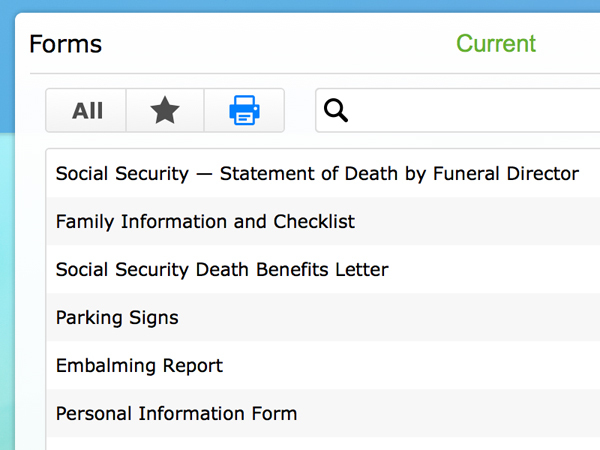 Ready to give Funeral Data Manager a try?